New York City officials today will reveal plans to invest $3.5 million in a new fashion epicenter called the Manufacturing Innovation Hub for Apparel, Textiles & Wearable Tech. Designed to drum up local manufacturing, create jobs and support up-and-coming designers, the 160,000-square-foot facility will be housed in the privately run Liberty View Industrial Plaza in Sunset Park, Brooklyn. 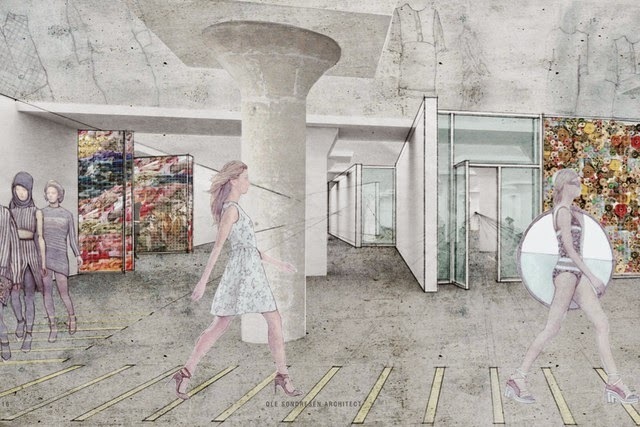 To bolster research, design, development and manufacturing for New York’s emerging designers and apparel manufacturers, the city, via the New York City Economic Development Corp., will award $3.5 million through its Industrial Modernization Initiative for the development of the space. That investment from the city will support the 110,000 square feet dedicated to job-intensive active manufacturing use. A total of $8 million is available through IMOD, with future allocations to be determined, according to city officials. Deputy Mayor for Housing and Economic Development Alicia Glen, NYC Economic Development Corp. president Kyle Kimball, Manufacture NY chief executive officer and founder Bob Bland and Salmar Properties cofounder Marvin Schein are expected at today’s press conference to highlight how the unoccupied space will be modernized and rejuvenated. With construction expected to get under way by New York Fashion Week in February, Ole Sondresen Architect, which has also designed spaces for Etsy and Kickstarter, will oversee the redesign, which is seen as a nine-month project. The space aims to house 20 to 30 businesses and up to 50 designers, Kimball said in an interview Tuesday. Of the total layout, 110,000 square feet will be dedicated to active manufacturing and the build-out should be about an 18-month project, he added. To highlight the significance of the investment, Kimball noted that there is about 1 million square feet of fashion manufacturing taking place throughout the Garment Center in Manhattan. The hub is expected to create or retain about 300 jobs. The creation of the Manufacturing Innovation Hub is meant to be a sign of the city’s commitment to supporting fashion and manufacturing by encouraging innovation and partnerships between the public and private sectors, according to organizers. Kimball emphasized that beyond the resurgence in fashion and manufacturing and economic development, the initiative is meant to build a den of innovation where various companies from different industries, including tech-savvy ones, will share ideas. He pointed to 3-D printing specialists MakerBot as an example of another tenant that can help foster ideas. The Manufacturing Innovation Hub for Apparel, Textiles & Wearable Tech will offer an assortment of services, including a workforce-development center to help turn out skilled workers who can earn well-paying jobs, a research-and-development center to help create innovative fashion and wearable technologycapabilities, a small-run factory specializing in sample-making, a design accelerator to create an educated pipeline of fashion and manufacturing talent, and incubator space containing 12 private studios, classroom space, conference rooms, a computer lab, an industrial sewing room, storage and work areas for 50 designers. Housed on the fifth floor, the Manufacturing Innovation Hub will also have 30,000 to 40,000 square feet dedicated to the headquarters for Manufacture NY. Having recently moved out of its Garment Center pilot incubator-production space, Manufacture NY is temporarily occupying a 2,000-square-foot area in Liberty View until its new setup is complete. Liberty View Industrial Plaza is a 1.1 million-square-foot, eight-story industrial building along the Sunset Park waterfront. Salmar Properties has completed significant renovations to the facility, including a new roof, windows, facade and utilities, in order to activate the building. The facility represents a key component of the city’s Sunset Park Vision Plan and the overall industrial policy. IMOD was created to encourage the continued growth of the manufacturing sector by having private industrial owners transform underutilized spaces to help small businesses, which typically employ one to 10 people and occupy less than 5,000 square feet. This sector is the fastest-growing element of the city’s industrial ecosystem. These companies are often too small for typical industrial floor plans on the market, so NYCEDC issued a request for proposals seeking transformative projects to address this gap. NYCEDC selected Manufacture New York and Salmar Properties, which operates Liberty View Industrial Plaza, to undertake the Sunset Park project. Manufacture NY strives to foster the next wave of businesses and create a transparent, sustainable global supply chain. Its Workforce Development Center, in collaboration with the Southwest Brooklyn Industrial Development Corp., will provide opportunities for entry-level and advanced technical career pathways in a range of apparel-related sectors, with 50 designers receiving training and product-development assistance in the Manufacturing Innovation Hub’s incubator space. The Manufacturing Innovation Hub builds upon New York’s suite of fashion initiatives, including the Fashion Manufacturing Initiative, a public-private program designed to support and promote growth of small businesses in the city’s fashion and manufacturing sectors, as well as seed funding for the Council of Fashion Designers of America incubator, professional mentorship in design and fashion management and networking and educational programs. The fashion industry accounts for nearly 6 percent of the city’s workforce, paying $10.9 billion in wages, and generating nearly $2 billion in tax revenue annually.